A few minutes after the crash, before the first fire trucks came on the scene from Arlington fire department, an explosion occured. 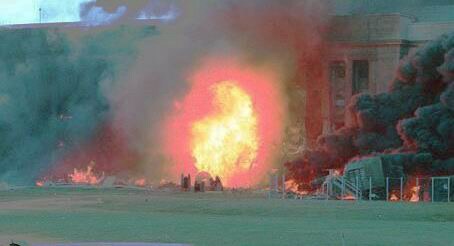 An hypothese about the second explosion at the pentagon crash is that the sprinkler system of the building did it's job. The crash and burning of the fuels contained inside the plane raised very fastly the temperature, allowing the automatic hoses to pour water. It is known that pouring water on a fuel fire is a very bad solution. When, moreover, there is a big mass of aluminum alloy heated at near 800 celsius (fuel combustion temperature), the violent reaction of aluminum and water occurs. This could have helped the fire to propagate inside the building. See technical details on  section 7, or . There is even worse. As a big quantity of hydrogen is produced, if the local conditions don't allow this hydrogen to be burnt, because the fire is in oxygen starvation (frequent case inside the buildings), this hydrogen can escape. It is possible that in this case the hydrogen found an issue (stair...) to get to the second floor (hydrogen is a very light gas). There could have been a pocket formed under a ceiling, for example protected from flames and heat over a false ceiling. When this pocket of hydrogen, probably mixed with air, was reached by the flames, it exploded. The pictures below shows this explosion which seems to occur on the second floor of the building. the plane's debris were in an important proportion transformed into a white powder (alumina) which was evacuated, naturally by the water flowing out of the building or removed by workers later, letting some people say that the plane had in most parts been "vaporized"
the bodies of the passengers and of all the persons killed in the crash zone were very difficult to identify. It can be assumed that only teeth and bones could be found with enough DNA to conduct analyses. Though it is not the subject of this web site, it could be interesting to analyse the World Trade Center crashes and following fires with this in mind : it could give an explanation to the very hot temperatures that could have melted the steel structures of the building and lead them to collapse. Such an accumulation of hydrogen / air mix could also have happened, especially in the central part of the towers (stairs, elevator shafts), and the explosions trigger the buildings collapses. The pentagon was under repair on 911. It is possible that on a particular point of second floor, a welding equipment, like an oxygen-acetylen blowtorch was disposed. The acetylen steel bottle could have exploded after a few minuts of exposure to fire, giving the fireball seen on the picture presented on your site, which seems to have a precise origin inside the building. If it is not acetylen, it could be the explosion of a butan or propan steel bottle used for such a job. I admit this theory is realistic. I have personnally seen a fire in a building where a few paint sprays were disposed. When the sprays temperature got to a certain point, they all exploded one after the other with a loud noise, making the people outside say stupidely that there were explosives inside this building ! Thus both the burning of hydrogen and kerozen produces water which can recombine with aluminum. The explosion on the second floor indicates that the fire (kerozen, hydrogen and various flammable materials) was in oxygen starvation, as hydrogen could escape. This is usual in a building fire. It can be assumed, therefore, as to calculate the possibility to make most of the aluminum materials of the plane disappear that 5O% of the water of the reaction is brought by the sprinkler system, and 50% from kerozen and hydrogen combustion : this is purely arbitrary, just to estimate orders of magnitude. Let's state that 60 l of water from the sprinklers can combine, with locally produced water, to react with 50 kg of aluminum. In these conditions, if a sprinkler hose can pour 6O l/mn of water, it means that 50 kg of aluminum can be transformed into alumina in the vicinity of this hose. If the fire lasts 30 mn, this hose will allow 1.5 tons of aluminum to be transformed into alumina. If there are 50 sprinkler hoses which pour water in the zone where the plane's debris are scattered, (not counting the water coming from some broken pipes and the water thrown by the firemen), 75 tons of aluminum can be transformed into alumina and disappear later from the gathered damage. This is more than a Boeing 757 contains. The overall process would require 3 cubic meters of water per minut, and a total of 90 cubic meter of water. Things should be refined, but it seems, at first sight, that a large part of the aluminum of a big airliner, like a B 757, could disappear in 30 mn in the fire of the building, if 90 cubic meter of water can be poured by the sprinkler system in this time, which seems reasonnable but should be checked by specialists of this type of equipment, the rest of the water necessary to the reaction being fed by the burning of fuels, hydrogen, and also sent from outside the building by the firemen. Listen to firemen's chief Ed Plaugher real audio interview by french online news service "Digipresse" about the use of foam and water on 9/11. Read Munters report to have an idea of the huge quantity of water thrown into the Pentagon. I could read, in some places on the web, rude attacks against this "Aluminum self combustion" theory. I agree that I am not a chemistry engineer. But the fact is that I worked, many years ago, in aluminum production factories. One in France (Pechiney, Nogu�res), one in the USA (Eastalco, Frederick, Md). I spoke several times with people in these plants of aluminum reactivity with water. I still remember, while visiting the cast-house tops, at Eastalco, the engineer who was coaching me (Steve Cazulis) showing me the bolts which holded the roof, explaining that in case of explosion of the cast-house, the bolts were calculated to break and leave the explosion energy develop upwards to protect the remaining of the factory. I can certify, and any person who knows the casting process of aluminum could confirm it, that it is a dangerous operation, due to the reactivity of molten aluminum with the cooling water. Closer from the Pentagon affair, there are cases of plane crashes, especially the catastrophe of Teneriffe where two planes collided on a runway, in which experts wondered how such huge masses of aluminum, part of the burnt planes, could have disappeared without leaving noticeable traces. I'm not doing science fantasy, but just writing from my own experience and knowledge. Professor Greening's paper on the possible role of molten aluminum in the WTC 1 and 2 towers collapse.